We are a small, fun bar in Udonthani Thailand with very reasonable prices. Many friendly and beautiful ladies available to help serve you. Leo, Chang, and Singha beers start at just 60 baht. A variable selection of Guest beers are on offer as available. 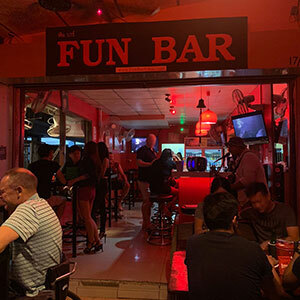 Bill & Fah are the proud owners of Fun Bar in Udonthani which has quickly become known as the best bar in Udon Thani. Bill has experience running pubs in London while Fah has experience helping Sunny from Terminal Bar manage bars in Thailand. Soon after getting married they realized they enjoy going out to bars, but there were no bars run to the level they were use to so they put their heads together and started Fun Bar. All of Fah's friends came to help out as staff which is why they have some of the most beautiful and friendly girls available and their bar is run as a place that they enjoy hanging out and they welcome you are a friend to share in the experience. Tuesday 2nd of April 2019. Saturday 30th of March 2019. Friday 22nd of March 2019. Wednesday 6th of February 2019. Monday 24th of December 2018. Sunday 23rd of December 2018. Saturday 8th of December 2018. Tuesday 13th of November 2018. Thursday 1st of November 2018. Tuesday 30th of October 2018. Friday 12th of October 2018. Wednesday 10th of October 2018. Tuesday 9th of October 2018. Friday 21st of September 2018. Wednesday 12th of September 2018. Sunday 2nd of September 2018. Wednesday 18th of July 2018. Across the street from Brick House Inn restaurant. In-between @Home Hotel and The Irish Clock.